Put the sugar and ginger in a pan; stir with 3 tbsp boiling water until dissolved. Simmer for 1 minute until syrupy, take off the heat and set aside for 10 minutes. Transfer to a cocktail shaker or Pyrex jug. Add a handful of ice, the vodka and lime juice. 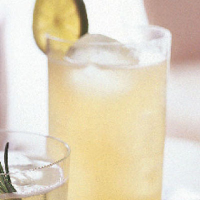 Shake, then strain into a highball glass over fresh ice. Top up with ginger ale.